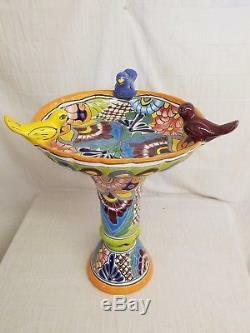 Hand-Painted Talavera BirdBath w/ Birds! 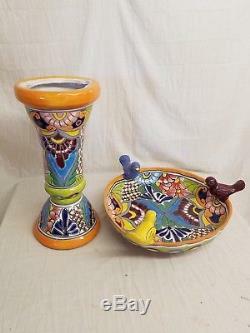 This authentic and hand-painted 2-piece set will sit handsomely in your back yard, garden or porch! This piece measures (together): 24" tall and 18". The Top piece alone is: 6" tall and 18" wide. The Pedestal alone is: 18" tall and 8" wide. 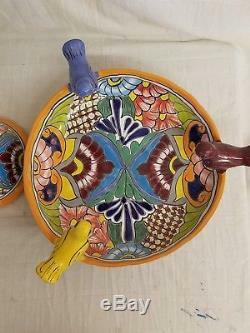 Talavera pottery is hand made using a specific red clay from central Mexico. This item is NOT mass produced! Each piece is individually hand-painted, therefore there are NO two pieces exactly the same. As with any hand made item, p. Lease expect some slight imperfections and/or variations. Be sure to take a close look at the pictures, and please keep in mind that the colors may be brighter or dimmer in the pictures. Please let us know if an item is taking unusually long to arrive. Thanks for looking, and Be sure to check out our store for many more GREAT ITEMS!! 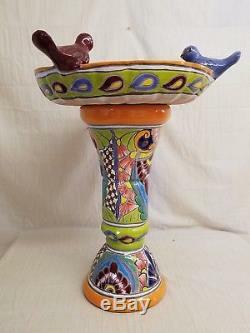 The item "Talavera 24 x 18 Birdbath Bird BATH Handmade Mexican Ceramic Garden Pottery" is in sale since Friday, July 6, 2018. 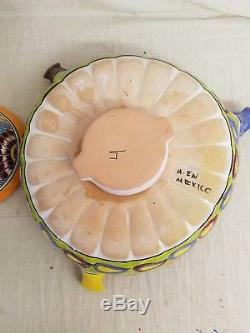 This item is in the category "Collectibles\Cultures & Ethnicities\Latin American\Mexico\Pottery". The seller is "sweetheartsyardart" and is located in Sanger, Texas. This item can be shipped to United States, Canada, United Kingdom, Denmark, Romania, Slovakia, Bulgaria, Czech republic, Finland, Hungary, Latvia, Lithuania, Malta, Estonia, Australia, Greece, Portugal, Cyprus, Slovenia, Japan, China, Sweden, South Korea, Indonesia, Taiwan, South africa, Thailand, Belgium, France, Hong Kong, Ireland, Netherlands, Poland, Spain, Italy, Germany, Austria, Israel, Mexico, New Zealand, Philippines, Singapore, Norway, Saudi arabia, Ukraine, United arab emirates, Qatar, Kuwait, Bahrain, Croatia, Malaysia, Brazil, Chile, Colombia, Costa rica, Dominican republic, Panama, Trinidad and tobago, Guatemala, El salvador, Honduras, Jamaica, Antigua and barbuda, Aruba, Belize, Dominica, Grenada, Saint kitts and nevis, Saint lucia, Montserrat, Turks and caicos islands, Barbados, Bangladesh, Bermuda, Brunei darussalam, Bolivia, Ecuador, Egypt, French guiana, Guernsey, Gibraltar, Guadeloupe, Iceland, Jersey, Jordan, Cambodia, Cayman islands, Liechtenstein, Sri lanka, Luxembourg, Monaco, Macao, Martinique, Maldives, Nicaragua, Oman, Peru, Pakistan, Paraguay, Reunion.